Two people suffered life-threatening injuries after crashing into a dump truck in Manchester, New Hampshire. Two people were critically injured after crashing into a dump truck Tuesday in Manchester, New Hampshire. Police say four vehicles were involved in the crash shortly before 7 p.m. at the Amoskeag traffic circle. 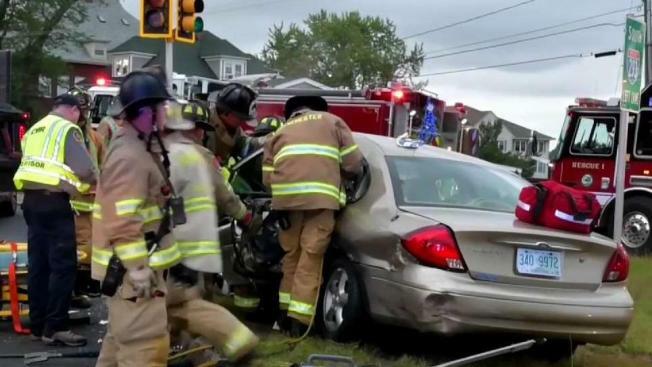 Three of the vehicles, including the dump truck, were stopped at a red light when a speeding car hit the truck from behind, according to authorities. A passenger in the car that hit the dump truck was ejected from the passenger side. The driver was trapped inside for about 25 minutes before being freed. Both were taken to Catholic Medical Center with life-threatening injuries. Three other patients were treated and released on scene. Part of the traffic circle was closed as police investigated.